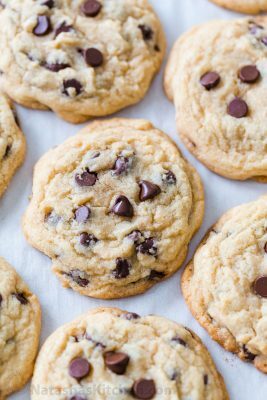 The BEST Chocolate Chip Cookies are big, soft, moist and loaded with melty morsels of chocolate. 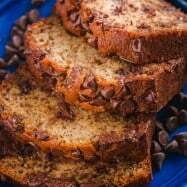 Chocolate chips make everything better, like our chocolate chip banana bread! Everyone needs a great chocolate chip cookie recipe. 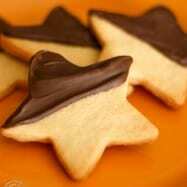 This simple and easy recipe turns out perfect every time and the cookies stay soft for days. Read the amazing reviews then try them for yourself. 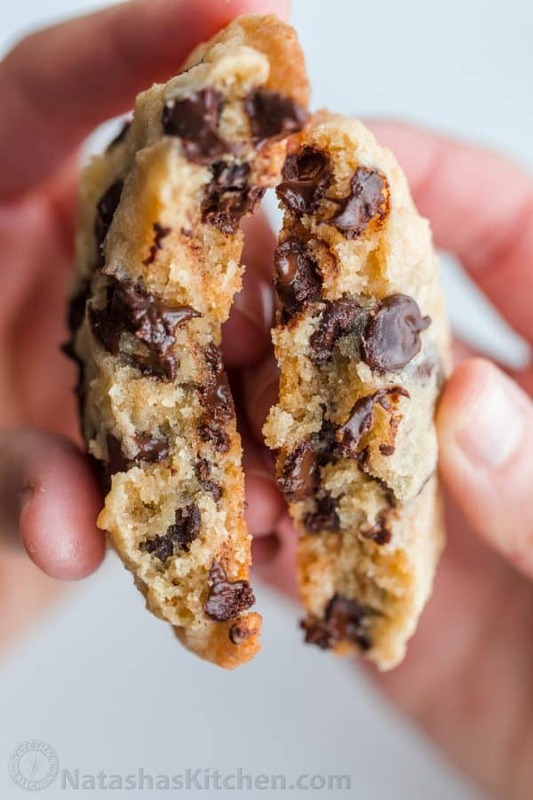 There is no match for homemade chocolate chip cookies with soft and warm cookie dough, gooey chocolate chips and the sweetest aroma coming from your oven. 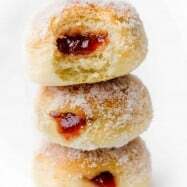 It’s just as tantalizing as homemade baked donuts! Whether you’re making Christmas cookies or surprising your kiddos with a sweet after school treat, memories are made with America’s most loved chocolate chip cookies. Measure ingredients correctly, especially the dry ingredients (spoon flour into the cup and scrape off the top for an accurate measure). For a prettier cookie, stud the top of each cookie dough ball with a few extra chocolate chips before baking. This chocolate chip cookie dough has simple ingredients with pantry staples you probably already have and the cookies can be baked right away (no chilling required). Which is the Best Chocolate for Cookies? 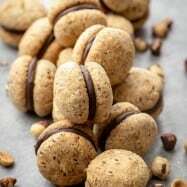 Semi-sweet chocolate chips (46% – 60% cocoa content) – Chocolate chip cookies are classically made with standard sized semi-sweet chocolate chips, but mini chocolate chips or chocolate “chunks” will also work. Nestle, Toll house, Ghirardelli, Guittard, Kirkland, Hershey’s,… most any brand will work. If you have the option, look for a package that states the cocoa content. Milk Chocolate chips (10% cocoa)- If you like a very sweet cookie, milk chocolate chips are a good option, just be prepared with your glass of milk! Bittersweet Chocolate Chips (70% cocoa) – produce a more ‘adult’ cookie – intensely chocolatey and less sweet. The Secret to Soft Cookies? Over-baking is the #1 cause of why chocolate chip cookies are hard. So, when are chocolate chip cookies done? The cookies should be removed from the oven when they are just turning golden at the base and the dough still looks a little raw on top. They won’t look done coming out of the oven and you’ll be tempted to keep them in there longer, but please do not over-bake. Removing them at the right time is the secret to soft chocolate chip cookies. 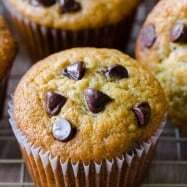 Why do Chocolate Chip Cookies go Flat? This is usually due to having the wrong balance of ingredients (i.e. not enough flour or too much liquid ingredients) causing them to spread out too much or become cakey. Also, check your leavening and make sure your baking powder is not expired and still active. To test baking powder, place 1 tsp baking powder into a cup and add 1/3 cup hot water – it should fizz and if it doesn’t, replace your baking powder. Why did my Cookies not Flatten? If your cookies ended up too thick and did not flatten, the #1 culprit is too much flour. Be sure to measure flour by spooning it into a dry ingredients measuring cup and scraping off the top. If you push your measuring cup into a flour bin, you will get up to 25% too much flour. This cookie dough is freezer friendly and we love freezing half of the cookie dough for another day. 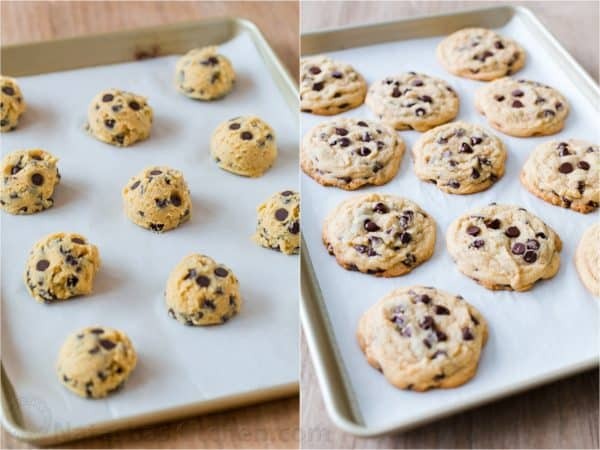 To freeze: place cookie dough balls onto a baking sheet or cutting board, cover and freeze for an hour or until solid. Once they are frozen, you can transfer them to a large ziploc bag and freeze up to 3 months. 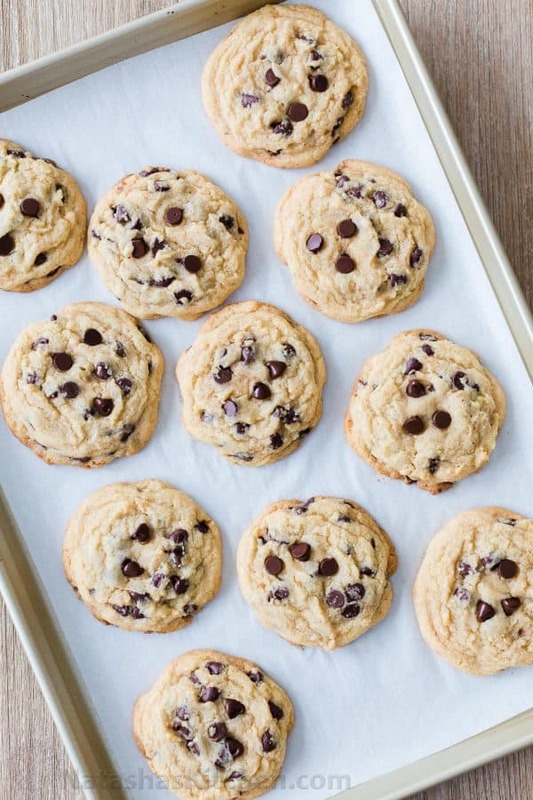 To bake frozen cookie dough: transfer to a parchment lined baking sheet and thaw the frozen cookies in the refrigerator for 3 hours over overnight before baking per the recipe instructions. This is the easiest cookie recipe and comes together quickly. Start with some quick prep: preheat oven to 350 °F and Line 2 cookie sheets with parchment paper or silpat mats. In a large mixing bowl, cream together butter, white sugar and brown sugar. Beat in eggs one at a time then mix in vanilla extract. In a separate bowl, whisk together flour, baking powder and salt then beat it in thirds into the batter. 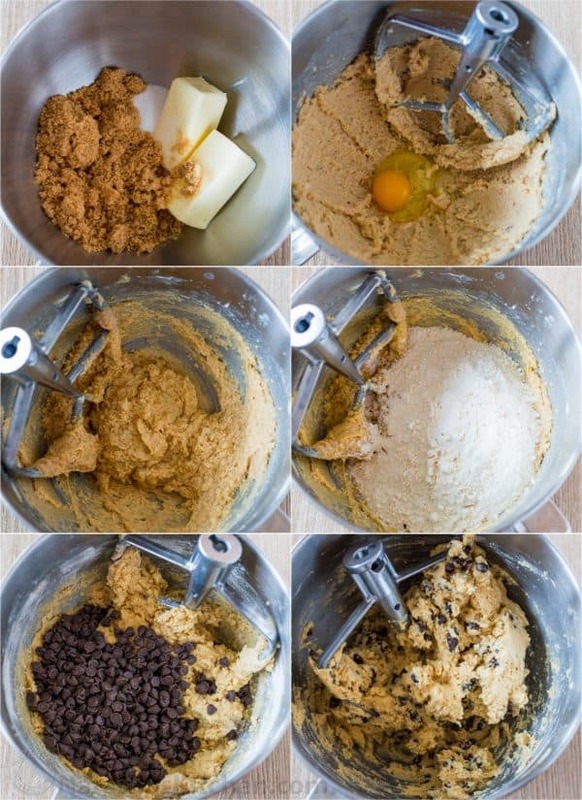 Fold chocolate chips into cookie dough. Scoop even balls of dough and arrange on prepared baking sheets. Bake one cookie sheet at a time. 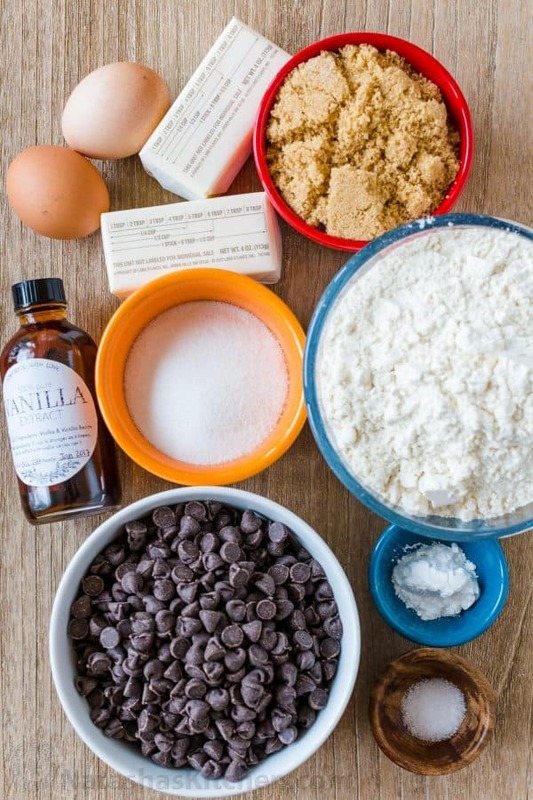 I hope this chocolate chip cookie recipe becomes a new favorite for you! 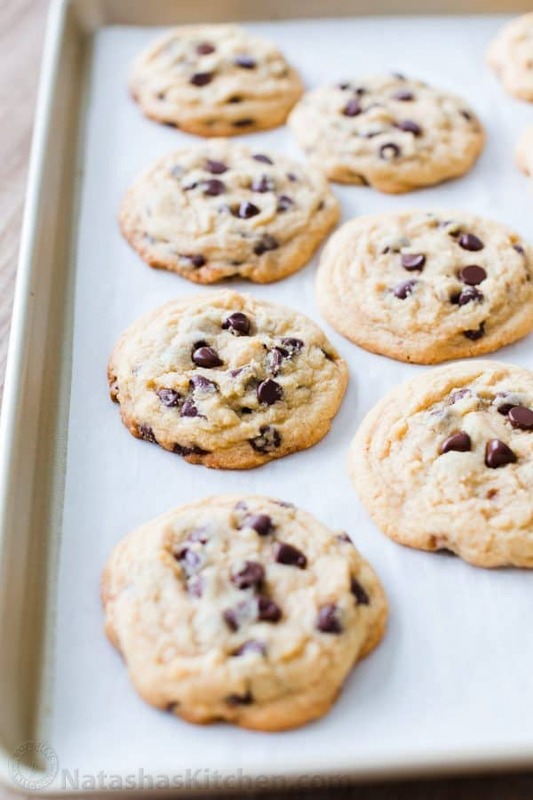 These chocolate chip cookies seriously stay soft for days! The BEST soft chocolate chip cookies. 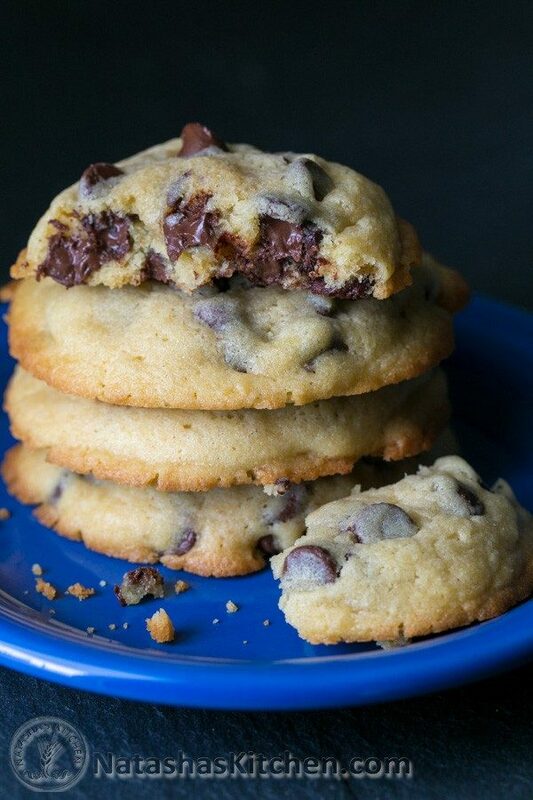 Big, moist and loaded chocolate chip cookies. 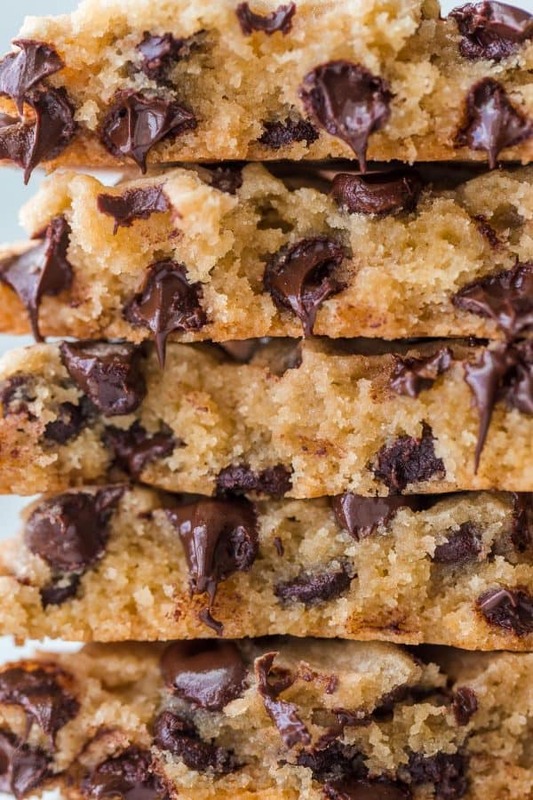 This chocolate chip cookie recipe is wildly popular with kids and adults! Preheat oven to 350˚ F after step 5. Grease cookie sheets. Preheat oven to 350˚ F after step 5. Grease cookie sheets. In a large mixing bowl with an electric mixer on medium/high speed, cream together the 2 sticks of butter, 1 cup of brown sugar and 1/2 cup of white sugar until creamy, light and fluffy. Add 2 eggs, one at a time, beating well with each addition, then stir in 2 tsp of vanilla. In a separate bowl, combine 3 cups of flour, 2 tsp of baking powder and 1/2 tsp of salt and beat into the batter in thirds just until incorporated. Fold in 2 cups of chocolate chips. Use an ice cream scoop to get even balls of dough, scraping against the side of the bowl to get a flat base. Place scoops of dough onto baking sheet about 2 inches apart. Mine fit onto 2 cookie sheets and made 21 cookies. Stud tops of cookie balls with a few extra chocolate chips if desired. Bake one cookie sheet at a time for 12-15 min at 350˚F, until edges are just turning light golden brown. The tops should still look under-baked. Allow cookies to cool on the baking sheet 5 min then transfer to a rack to cool. To measure flour correctly, spoon it into a dry ingredients measuring cup and level the top. Do not dip a measuring cup directly into the flour bin or you can compact it and get up to 25% more flour. We first published this recipe in 2012 and have improved the recipe to make it even easier (eliminating the need to chill the dough before baking). Mmmmm soft chocolate chip cookies! 🙂 My children are always REALLY happy when I make these. My favorite cookie recipe. Thank you! I love all your recipes and made a lot of them. I have a question: when I chill the cookie balls, do they need to cover with plastic wrap? Help! Mine seem to be scone like! These cookies are absolutely delicious and super easy to make. I chilled the entire batter before rolling and baking and came out perfectly. The raw batter tastes even better. Well done on an incredible recipe. The molasses in the brown sugar of your chocolate chip cookies is acidic requiring the use of baking soda, not baking powder. Your recipe is very similar to the one on the back of Hershey’s Chipits Milk Chocolate Baking Chips. I was a little bummed out when I saw that it required baking powder, baking soda and 2 and 2/3 cups of flour. I’m not sure what I am doing wrong, but it seems whenever I make a cookie recipe that calls for those three ingredients. The cookies taste a bit off. Can I line cookie sheet with parchment paper and not grease? Or do they have to be greased? Thank you! Amazing recipe, the best cookies recipe I made! I love these cookies!! I was wondering if I could make them into Chewy Chocolate Chip Cookie Bars?? Thank you so much for the recipe.